We are continuing to evaluate the styling based on feedback from users. 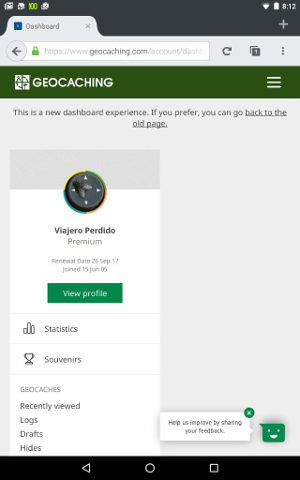 While some people are not in love with the new design there are a lot of people who we have heard from that really like it (and this includes existing geocachers). Just wondering if this implies that some, perhaps many, perhaps even most, of the people providing feedback aren't existing geocachers? Visual appeal is one thing, but providing the functionality that's needed and used by the broad spectrum of geocachers, particularly the more experienced ones, is what's fundamentally important. Recent Logs: As I mentioned earlier, we will be updating this feed to toggle only your logs. Missing from this statement is how many of our own recent logs will be viewable. As a bunch of people have stated, we would like to be able to see the most recent 30 days worth of logs, as it is a very useful snapshot of our own recent activity. There is way too much information in the all logs menu selection (almost 9000 records for me), and way too little information if just the most recent 5 days or so is displayed. So please give us the option to see 30 days worth of our own recent logs! neat, will this script be available for download for others? Hmm. It's no different for me. Still just a band of grey space on the right. My 7" Android looks just like this in portrait using Firefox but landscape shows the recent views and logs. I generally am not a fan of landscape. Fortunately Chrome is working either way. Considering the page is still an active work in progress by Groundspeak, with many changes and updates to be expected, significant and minor, it's not really feasible to make an official release to share; I'll likely be making just as many updates, more for technical curiosity than an attempt at keeping a working final script for propagation. How about include the log text on the Dashboard (collapsed by default) and link the the cache name directly to its listing? You would save a lot of processing power because my friends usually write interesting stories and I will open the logs one by one. It would be much more convenient if I could read them right on the dashboard. I got inspired by this to play around a bit myself. This is my version of the dashboard. I added a search box that takes me directly to the map. That was easy to add, and a lot more useful than I first thought. Perhaps something like this this can be permanently added to the tool section? There still are people - including me - who don't care about being stalked but don't have a use for stalking others (i.e. being flooded with their logs). But if there will be filtering in future, this really wouldn't be a problem anymore. You're missing a way more important issue! It's not about MY logs to be seen by others... It's about OTHER logs that I'm now required to see INSTEAD of my log! The actual new dashboard shows me a huge block with recent views of what I don't need or care at all. And it just shows 3 recent logs, no more space for more on the first screen (and it's a big screen, for others it might be even worse!). I so often use the option to see MY logs from the last 30 days and now I can only see logs from the last 2 days? Are you serious, Groundspeak? And even with the latest changes, waste of space is still so f***ing bad. I'm not that blind yet and I still like the old style way more than this "fancy" new one. I just replied to the concerns about stalking, but you are definitely right. One of the features I used most on the old "Dashboard" was the list of my Logs in the last 30 days. Now these are gone (?) - or polluted with the logs from others ... ? I decided a picture is worth any number of words. This is definitely a new experience - the only difference in the view at any one time is the amount of circle shown. Edited to note that my Android tablet has a similar appearance, only without anything in the gray area. These are the primary tools I use to interact with this site. Wouldn't it be the best idea to make the "Dashboard" customizable? I agree, I don’t want my dashboard cluttered up with other cachers’ post. I don’t know about anyone else, but I see so many posts from others that none of my stuff even shows up; except the recently viewed caches. Plus there is a lot of information about the posts that was in the old dashboard that doesn’t show up. Now I have to go to a different page where all the information I use from the dashboard. I would be nice if I could turn off all those entries for others. OBTW, the issue of privacy it moot since anyone can see anyone else’s profile information by going to project-gc.com. It’s been that way for as long as have been using the site. It’s also irritating that now that I’ve looked at the new pages they have become my default pages and now I have to select to view the old page. Technically, their benefit is to provide more immediate visual confirmation of page loading; zippier loading of the bounding frame structures with content loaded unintrusively, less bottlenecking by breaking down the segments that can be loaded independently of each other. It's more popular now with the more widespread use of mobile devices where bandwidth may be of more concern, but moreso in the recent past when rendering times were slower on mobile devices than PCs. Asynchronous loading doesn't hang the browser with HTML rendering leaving it to do other things (like interact with the user) while it waits for other data transfers to complete. There are numerous benefits. The issues you cite are with bad and unoptimized programming and implementation, not the inherent methodology. That said, most mobile devices are now much more powerful and can render full-page content much more quickly than they used to, so using asynchronous loading 'for the sake of it' is definitely of less importance and benefit now. It is and I am very appreciative for the constructive and thoughtful feedback! If the html file is really large then "immediate visual confirmation of page loading" and "zippier loading of the bounding frame structures" are rational reasons for adding additional complexity to the site. Another reason is if something has to be changed after the page is complete - like the "New message indicator" of the message center. Let's look at the dashboard: The old version is 1.5 MB in size, the new one 2.0 MB (for my profile, with some caches in history/friend-logs and with all related files). Now I made a simulation of 3G networking (750kbit/s) - at least in Germany this is the least usable mobile connection (forget GPS and EDGE). The DOM of the old version took 11.31 s until completion - as the stylesheet arrived in the meantime and assuming all size-information for missing images is given, this is where the browser could render and display the whole page. All 91 requests completed after 14.61 s.
The new version took 7.15 s for DOM completion and 24 s for all 104 requests are finished successfully. On these tests I conclude that the 3 Seconds the "bounding frame structures" arrives earlier don't outweigh the overhead and complexity. OK, I'm not a professional web designer - just an interested hobbyist ... I did some jobs in the past, where web technologies played some role, but far not comparable to a huge project like geocaching.com. I also admit, that my tests are just simple estimations, for example I disregarded that many modern browsers try to show the page as soon as possible. Fun fact is that the new dashboard is larger in size and has more files to load than the old one, but doesn't deliver much more information for the user. As this answer took me longer than an hour to write (it's difficult for me to write long English texts and I try hard to avoid mistakes), I conclude that I finally don't care what could be best for Dashboard behind the scene. Of course it'll be what Groundspeak thinks fits best. Maybe it's only my own opinion that the best technique to achieve the desired result, is the simplest technique (in respect of computer/network-resources) that makes it possible. In my opinion the way that uses the least resource should always be preferred as long as it doesn't make the code unmanageable (i.e. don't do everything in assembly code) - and today's devices are strong enough is a bad argument, as every operation that hasn't be computed saves energy (modern devices are also able to adapt their power consumption if they don't need it). I also think that the more lines of code the higher is the risk of security vulnerabilities and errors. This is my way of thinking how technology resources should be used and at least as long I'm not forced to I will act in accordance with it. This also means if someone could demonstrate me that asynchronous loading is the most resource saving and simple technique in any case then I'll use it. I just looked at my new profile page. Not too bad. However, there's too much (to me) wasted space at the top. My picture could be smaller - I don't have a need to have a large pic up there. The second set of info - premium, joined, view posts, finds, trackables, location... should be up on he same line / layer as my picture - no need to push everything down an inch or two. You're taking up too much space for that info. The recently viewed and activity fonts are way too large. These entries should all be on one line, as in the past. I personally like smaller font and displaying more caches per page than fewer cells (my HTML table analogy) with more information spread across several lines in the cell. For my recent logs, you're taking up 2 lines. Too too wasteful. Please consider making the avitar smaller and putting everything on the same line. After a busy day I wouldn't be able to see the day's activities in the new format. Actually, do you need to put the avitar on each line? I know that it's different for each "friend" activity, but you'll note that many users are unfriending everyone just to make the dashboard more palatable. Would rather see my recent logs, as on old page, not all my friends logs. My way of looking for caches is to open up the map. I don't perform any searches, I don't click on links my friends have found as they don't live around here anyway. I click on the map and zoom into the area I plan to cache in. With this new dashboard I cannot find the link to the map anymore. Plus, being on a 14" notebook there just is too much whitespace. I have to scroll and scroll to see most of the dashboard. please keep users of smaller notebooks in mind when designing the dashboard. please bring the map link back to the dashboard. I know I can go via the Play button, but it's an additional click, which is somewhat annoying if you don't have a mouse or touchscreen. Additionally, I'm generally not too keen on having the menue items on the left side, being righthanded. For me it feels like everything is on the wrong side. If I put my finger on the touchpad I do it such that the mouse pointer starts on the right side. I then have to move to the left to access menue options. Moving right to left feels counter intuitive for me. But maybe that's only me? Each section preferably being collapsible and hideable. And without all that whitespace! I would make all of these optional - I don't want a friend feed and unpublished or needs maintenance only comes up on occasion. I was thinking yesterday an optional way to display recent photos I've taken would be nice. Sometimes I look at them and realize something needs editing, but there is not even a link to the gallery on the dashboard. I would find a link to the gallery more useful than a map link. I do my planing elsewhere. But if a map link is not presently there, It should be added. Right near the gallery link. As long as I am dreaming, a calendar widget might also be nice to mark future plans or easily go back to past dates. The current iteration of the dashboard does not add much in terms of additional functionality. However, the goal of this current version was to create a base that new features could be added to. We are working on plans for additional features that will bring a lot of additional value to the page. Recently Viewed: We are looking into options for allowing certain sections, like Recently Viewed, to be collapsible. with your new All Finds Page. Mine took ages to load with over 7000 finds. With the old calendar, I could quickly navigate to a specific date and see ALL the logs I posted that day (not just finds) - which I used a lot and found really useful. And it didn't take hours to load up. I'm also a +1 for bringing back the old map link to quickly get to caches around your home co-ords. The old "my" page had all the useful links (geocaches, stats, lists, etc) across the top, so they were immediately accessible as soon as I landed on the page. Now all these useful things have been shuffled into the sidebar and are "below the fold" so I now need to go scrolling to find the things I really need, add to this that the sidebar doesn't clearly distinguish between the group headers and the clickable links and the whole experience is awful. Wow, that's a really cool page. I don't remember seeing it before, but I've often wanted that function. How do you get there from the old profile page? I can't understand how I could miss something so useful. The old log page I'm familiar with already had the problem of freezing the browser until all of my thousands of logs were loaded, so I don't blame that on the new profile page. But I would have thought it would be one of the first problems to fix in any massive overhaul. Edited to add: Oh, geeze, for heaven's sake! 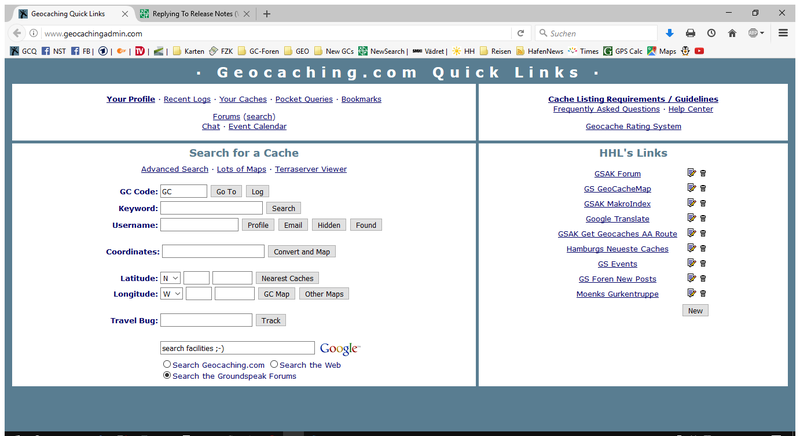 I never in a million years would have dreamed that a link labeled "Geocaches" would take me to such a useful log browser. That link is so utterly misnamed, I never tried it until you pointed out where it leads. Yeah, thanks, I got the link, I just didn't know where it was on the old profile page. For others that haven't found it yet, it's called "Geocaches" in that list of links at the top of the page. (Yes, I definitely miss that convenient list, too.) From the name, I always assumed it would take me to a list of, you know, geocaches, but it actually takes me to that date based browser of logs that cazmockett showed. Unfortunately, you can't limit the date based browser to only logs of a specific type: the links to specific log types on that page takes you out of this date based browser back to a list that requires listing all of that type of log you've ever filed. But at least I can use this to get to those sub-lists. Until now, if I want to look at, say, all NMs I've filed, I've clicked on the other link named "Geocaches", the one down at the top of the "Your logs" list, which, after all, because of its location, is the one would logically guess leads to a list of logs. Then I have to wait forever for that page to load all my logs before I can click on the specific log type I want. 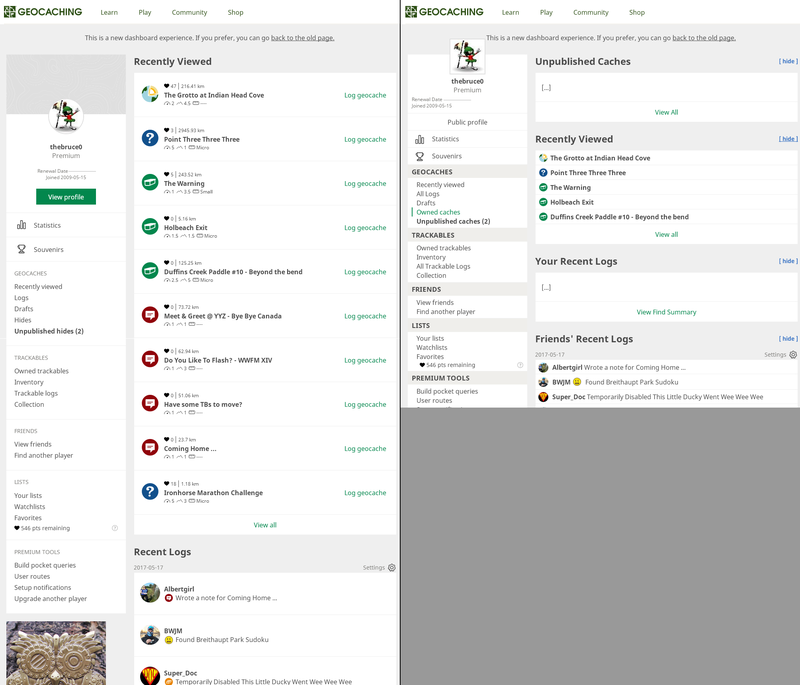 Two links, both labeled "Geocaches", leading to two different pages that act entirely different, yet neither a list geocaches. Who'da thunk it? How can I navigate from my Dashboard to this page? You can't. This link is missing. A link ("Logs") shows a similar page but without the calendar. You even may enhance this page with own custom links. That doesn't make sense! I think the "experience" is a hype. You haven't found that page in all the years you're using the old dashboard. I always forget where I find the useful summary of all the events where we logged "Will attend" and sure there are more users that have the same problems. This proofes that the old dashboard is confusing and it's a good idea from Groundspeak to make a new one. Please make an Option, that I can block my friends logs. Nobody wants this feature in "Recent Logs"! And i don't want to ask all my friends to switch it off. Take it just only as a my look at the new web, overall I like the changes who you makes. In about 2013 the page to post new log for geocache was about 1.5 page long on my computer. After the design update by that time (plus minus a year or so) it went above 2 pages. But what you have done is a disaster. The page exploded to 4 pages with plains of white space and extraordinary big characters screaming to my eyes. Thanks for the opt-out (hopefuly permanent!!!) but this doesn't work to field notes!!! Ah yes, sorry, you call it Drafts now... To log ~60 finds last week was one big pain in the a**. You are pushing me to log directly online from Locus with just the predefined TFTC from now on. Maybe with some explanation why am I doing it giving you all the credit. Or are you going to fix it? The old pages are maybe not so nice (they are to me!) but they are efficient. And this is what matters to me. Yep, I just dumped all my friends as I don't want to see that on my dashboard. I doubt this was the objective of the excercise but as the friends feature doesn't really give me anything useful I'm done with it now. You are pushing me to log directly online from Locus with just the predefined TFTC from now on. Sadly I can see that this will be the end result for a lot of cachers, I hope TPTB take note and make some serious improvements to the logging screens. I have used GSAK for Logging for years. Very convenient handling! That is the best idea and my personal recommendation to avoid the original log pages. GSAK is very customer oriented software development. I hope I will never have to use the GC Log-web-site. I use that old page with the calendar all the time. Today I was trying to find it from the new Dashboard, and could not. I was going to post something about that when I found this post. I find this very useful to see all the logs I did on a specific day. I use it a lot to double check that I remembered to log everything. It is also a nice way to look back at a specific days caching at a glance and reminisce. I don't mind too much if there is wasted space or what the GUI looks like, but I don't like losing features like this. The fact that on the old page it was hard to find does prove I guess that the old page isn't always clear. But on the new page this seems to be gone (or it is even less clear as I can't find it). I hope I will never have to use the GC Log-web-site. I would say that it probably doesn't matter to Groundspeak as they get the same $30/yr whether you log through the site or through a 3rd party app. My friends has posted a Needs maintenance log and there is a wrong icon used for his entry in my feed. So, please, bring the About tab as the default, for all people having made the effort to fill information there. I know this is a view that will divide opinion, but I disagree. You have a huge profile page, with loads of badges/souvenirs/images from the GSAK stats generator - all of which take time to load and eat up bandwidth. If I want to look at your profile I'm usually doing it for a specific purpose and it's unlikely anyone is going there to look at your GSAK achievements page so I would prefer it to be under the "About" tab where I won't have to wait for it to load unless I'm specifically interested in seeing it. My own profile page has a bit of info on it, which I'm sure nobody is really interested in so it's fine by me if that's stuck away on the About tab. Thank you Pontiac, we will get that fixed. I understand that some people do not want to see their friend's logs in the Recent Logs feed, but why remove your friends? What I do not understand is that 1) we have repeatedly clarified that we are updating the Recent Logs to show only your logs (with the option of seeing your friends), and 2) you are not being forced to use the new page. The friends functionality on the website has historically provided very little value to the game, but we are hoping to change that. 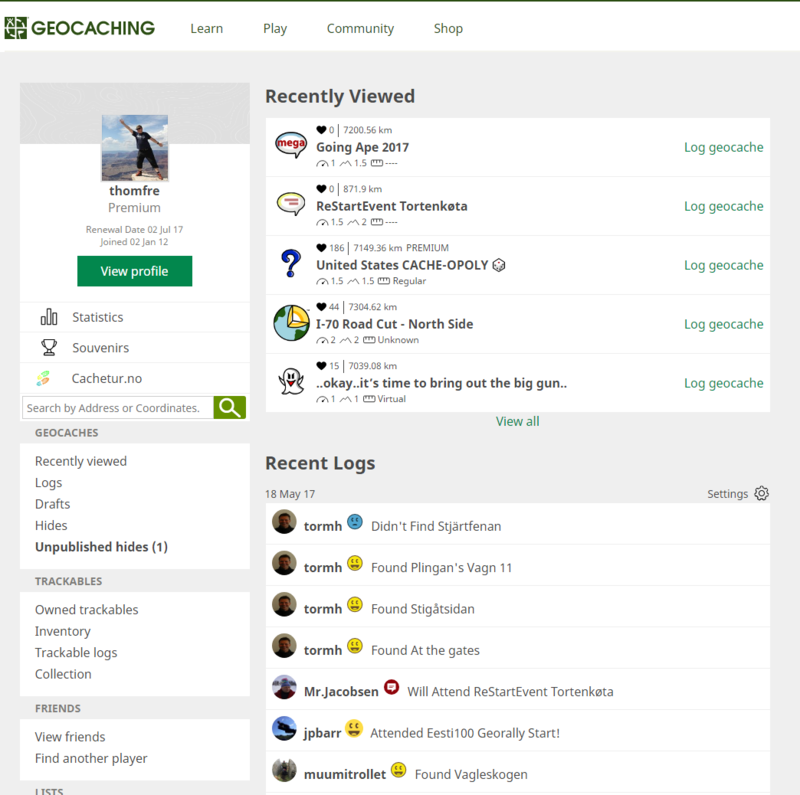 We are not looking to make Geocaching into the next social network, but we know that many people find geocaching more enjoyable when with 1 or more additional people. With that in mind we will be working to make it easier to connect with other people, plan and share experiences, and interact with the community (if you choose). To me, this seems like all the more reason to create a separate user-editable tab for statistics, souvenirs, badges, or other trophies. That would leave the "About" tab for a more personal view of who someone is. I agree. Wasn't too long ago I'd time-out on profiles like that. Most times I look at another's profile, it's only to see if they're attempting to dupe us (in the forums). Just not too interested in what others think of themselves I guess. Gave DP's a try, and the page didn't load (from the PC I'm using now), and simply switching to the "new public profile" it was immediate. Without making any promises this is something that we are thinking about as well. - Wherever I have a "Discovered" TB log, the dashboard is not showing the location where the TB was discovered. Instead it shows "Discovered [TB NAME] at" with nothing after the word "at." This applies both for TBs that are currently in a cache, and TBs that are currently in another cacher's inventory. - Logs for dropping off TB's do not include the location, but also don't include the word "at." I.e., "Dropped off [TB NAME]" is the entire log listed. - Logs for visiting TB's to a cache *do* include the visited cache. I.e., "Took [TB NAME] to [CACHE NAME]"
- "Discover" and "Visit" logs show the TB icon to the left. "Dropped Off" logs do not show any icon at all. When's that gonna happen? I don't want to have to wait, the new dashboard is already annoying enough right now. 2) you are not being forced to use the new page. The friends functionality on the website has historically provided very little NO value to the game, but we are hoping to change that. A little correction by me. There's currently no upside in having "friends" and a significant downside, why would I want to keep them? Ok, seriously now: I still don't see a single part within the new dashboard that would work better for me up to now. I only see less info in addition with simply more that I'm not interested in at all. Sorry to say that. I also don't care at all about a specfic mobile view as I always prefer the standard desktop view and always set desktop view within my browser on the mobile phones and tablets. Just hate this waste of space and kiddie-ish bonbon style. Might be I'm just too old that for. But I prefer information vs. "style"
My statistics are shown within my personal profile, that's why I'm using GSAK/FindStatGen and I know many people using this or similar stuff. So I wouldn't use the Statistics link to the left at all. Roughly the same with Souvenirs. Even if I collected quite some of them they aren't important for me so the placement is way too prominent for my personal like. Recently Viewed: Still way too prominent. As I recently viewed the recently viewed caches I'm most of the time no longer interested in these and they just waste space. I would prefer an option to complete disable this part. Recent Logs: Not interest at all in seeing the logs from my friends. The old style simply was close to be perfect for me. The only "issue" I had with the old style was the order of the logs. Not all of them really have been shown in the order of entering them (I think Discover and NM/NA-Logs seemed to be in a special order). But everything there was way better than the actual view with just 2 days. 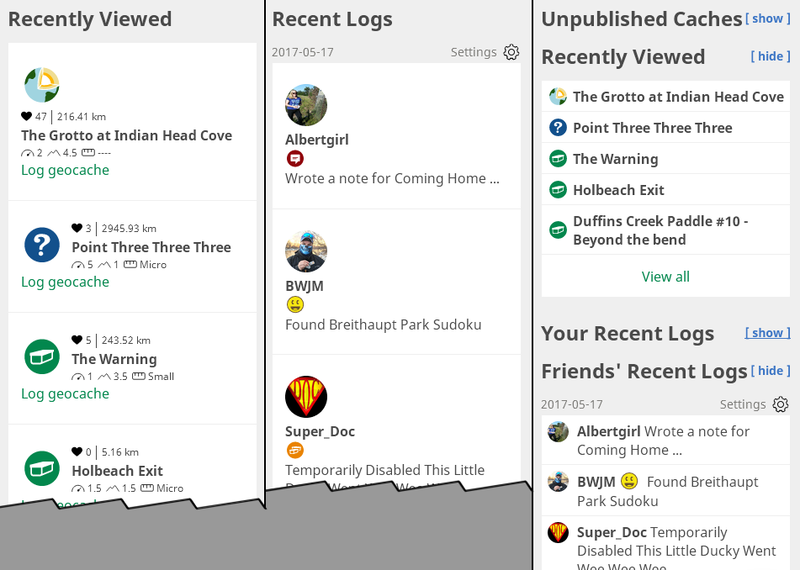 Now I need to check for these logs in 2 different places: Geocaches->Logs and Trackables->Trackables Log. I simply would like to stay with the old style! What also is missing in the new list is the link to the cache itself. Now I need to click for the log and then click the cache. Why not 2 links? 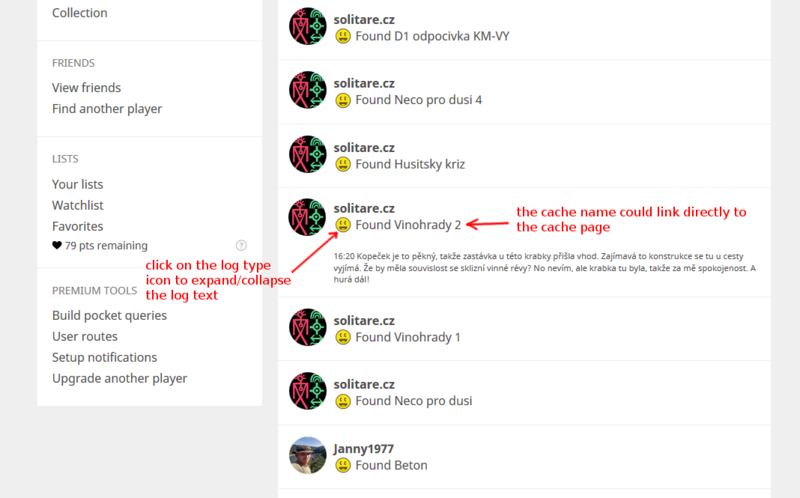 Cachename linked to the cache and "Found/Didn't Find/etc" linked to the log? Consistency: At Recently Viewed you show D/T/S and at Recent Logs you don't. Dashboard: I don't miss anything on the old dashboard, I only miss things on every single new page you came up with in the last time ;-) That's why I'm still using the old pages. I'm trying the new ones once a day but up to now they are still unusable for MY needs! But at least I'm still trying Today I haven't seen a single of MY finds in the recent logs area even if I've found 12 caches yesterday. So I'm urgently waiting for the moment I can finally turn off the other logs. But I fear I then still best case can see the logs of the last 2 days vs. the 30 in the old version. Please allows us to able to get the same options for the recents as we have with the old version. Would be more than appreciated! Style again: I guess the feedback is that different as people use different devices. On a computer with a big screen the new pages are simply still wasting sooo much space, but on a tablet or mobiel it might work better. So I would still suggest different styles for desktop and mobile pages!